Ask most IT Administrators in small to medium sized organizations to recover an Exchange mailbox, and you’ll get responses like, “how important is it to recover it?” and “How much of it is gone?” You might even get the slightly patronizing “Oh, well you were close to your storage quota anyway” This is IT-speak for “I don’t want to recover it” (labor intensive), “I’m not sure if I can recover it” (it didn’t work the last time they tried), or “I can’t recover it, and don’t really want to tell you that.” Trust me, I’ve been there. The recovery process has ranged anywhere from non-existent (Exchange 4.0) to supposedly easy (according to the glossy ad of the 3rd party solution you might have purchased, but could never get to work correctly), to cautiously doable, but an incomplete solution, with later versions of Exchange. As each year passes, I’m always hoping that technology can make the process easier, without pushing through another big purchase. I got my wish. Technology has indeed improved the process. I recently had a user mailbox’s contents vanish. Who knows what happened, but I had to get the mailbox back fast, so I had to familiarize myself with the process again. This time, since my Exchange 2007 Server is virtualized, and the Exchange databases and logs reside on guest attached volumes, I was able to take advantage of EqualLogic’s “AutoSnapshot Manager Microsoft Edition” or ASM/ME. ASM/ME allowed me to easily recover an Exchange Storage Group, then mount it as a Recovery Storage Group (RSG). From that point I could restore just that single mailbox on top of the existing mailbox. What a refreshing discovery to see how simple the process has become. And that, it just worked. No weird errors to investigate, no tapes to fiddle with. It was a complete solution for a mailbox recovery scenario. The best part of all, was that its a function available free of charge to any EqualLogic user who is using the Host Integration Toolkit (HITKit) on their Exchange server. 1. On the Exchange Server, open up ASM/ME, highlight the smart copy collection that you’d like to recover. I say “Collection” because I want to recover the volume that has the DB on it and the volume that has the Transaction Logs on it at the same time. 4. It will prompt for two drive letters not being used. This will represent the location of the restored volumes. So if the Exchange databases are on E: and the Transaction Logs are on F:, it might prompt you to used “G:” and “H:” respectively. 6. Close out of ASM/ME, and launch the “Database Recovery Management” in the Toolbox section of the Exchange Management Console. This leads to the “Exchange Troubleshooting Assistant in the Exchange Management Console (EMC). 7. Run through the restoration process. It will restore the selected mailbox on top of the existing mailbox. 8. Once it is complete, as the dialog above instructs, you will need to dismount and logoff the smart copy collection set with ASM/ME after the RSG is removed. The process was fast, and worked the very first time without error. I’d still prefer to never have to recover a mailbox, but it is nice to know that now, thanks to ASM/ME and the Exchange Database Recovery Management tool, that its really easy to do. 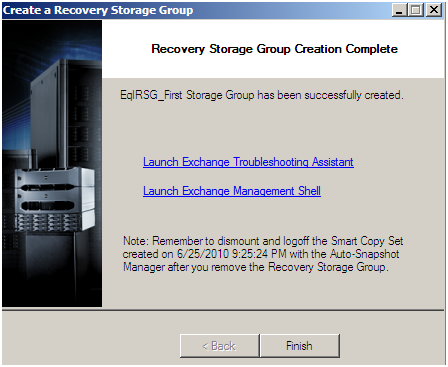 Working with a Recovery Storage group in the Exchange Management Shell (EMS) instead of the EMC. If you had asked me 6+ weeks ago how far along my replication project would be on this date, I would have thought I’d be basking in the glory of success, and admiring my accomplishments. …I should have known better. Nothing like several IT emergencies unrelated to this project to turn one’s itinerary into garbage. A failed server (an old physical storage server that I don’t have room on my SAN for), a tape backup autoloader that tanked, some Exchange Server and Domain Controller problems, and a host of other odd things that I don’t even want to think about. It’s overlooked how much work it takes to keep an IT infrastructure from not losing any ground from the day before. At times, it can make you wonder how any progress is made on anything. Enough complaining for now. Lets get back to it. For my testing, all of my replication is set to occur just once a day. This is to keep it simple, and to help me understand what needs to be adjusted when my offsite replication is finally turned up at the remote site. I’m not overly anxious to turn up the frequency even if the situation allows. Some pretty strong opinions exist on how best to configure the frequency of the replicas. Do a little bit with a high frequency, or a lot with a low frequency. What I do know is this. It is a terrible feeling to lose data, and one of the more overlooked ways to lose data is for bad data to overwrite your good data on the backups before you catch it in time to stop it. Tapes, disk, simple file cloning, or fancy replication; the principal is the same, and so is the result. Since the big variable is retention period, I want to see how much room I have to play with before I decide on frequency. My purpose of offsite replication is disaster recovery. …not to make a disaster bigger. The million dollar question has always been how much changed data, as perceived from the SAN will occur for a given period of time, on typical production servers. It is nearly impossible to know this until one is actually able to run real replication tests. I certainly had no idea. This would be a great feature for Dell/EqualLogic to add to their solution suite. 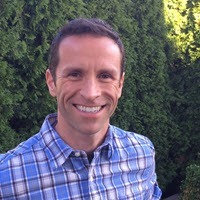 Have a way for a storage group to run in a simulated replication where it simply collects statistics that would accurately reflect the amount of data that would be replicate during the test period. What a great feature for those looking into SAN to SAN replication. Below are my replication statistics for a 30 day period, where the replicas were created once per day, after the initial seed replica was created. 3 GB for servers with guest iSCSI attached volumes. The replica sizes for the VM’s were surprisingly consistent. Our code compiling machines had larger replica sizes, as they write some data temporarily to the VM’s during their build processes. The guest iSCSI attached data volumes naturally varied more from day-to-day activities. Weekdays had larger amounts of replicated data than weekends. This was expected. Some servers, and how they generate data may stick out like sore thumbs. For instance, our source code control server uses a crude (but important) way of an application layer backup. The result is that for 75 GB worth of repositories, it would generate 100+ GB of changed data that it would want to replicate. If the backup mechanism (which is a glorified file copy and package dump) is turned off, the amount of changed data is down to a very reasonable 200 MB per day. This is a good example of how we will have to change our practices to accommodate replication. Up to this point, the only step to reduce the amount of data replication is the adjustment made in vCenter to move the VM’s swap files off onto another VMFS volume that will not be replicated. That of course only affects the VM’s paging files – not the guest VM’s paging files that are controlled by the OS. I suspect that a healthy amount of changed data on the VMs are the paging files for the OS. The amount of changed data on those VM’s looked suspiciously similar to the amount of RAM assigned to the VM. There typically is some correlation to how much RAM an OS has to run with, and the size of the page file. This is pure speculation at this point, but certainly worth looking into. The next logical step would be to figure out what could be done to reconfigure VM’s to perhaps place their paging/swap files in a different, non-replicated location. Two issues come to mind when I think about this step. 1.) This adds an unknown amount of complexity (for deploying, and restoring) to the systems running. You’d have to be confident in the behavior of each OS type when it comes to restoring from a replica where it expects to see a page file in a certain location, but does not. How scalable this approach is would also need to be asked. It might be okay for a few machines, but how about a few hundred? I don’t know. 2.) It is unknown as to how much of a payoff there will be. If the amount of data per VM gets reduced by say, 80%, then that would be pretty good incentive. If it’s more like 10%, then not so much. It’s disappointing that there seems to be only marginal documentation on making such changes. I will look to test this when I have some time, and report anything interesting that I find along the way. One of the first problems to surface recently were issues with my 6224 switches. These were the switches that I put in place of our 5424 switches to provide better expandability. Well, something wasn’t configured correctly, because the retransmit ratio was high enough that SANHQ actually notified me of the issue. I wasn’t about to overlook this, and reported it to the EqualLogic Support Team immediately. I was able to get these numbers under control by reconfiguring the NIC’s on my ESX hosts to talk to the SAN with standard frames. Not a long term fix, but for the sake of the stability of the network, the most prudent step for now. After working with the 6224’s, they do seem to behave noticeably different than the 5242’s. They are more difficult to configure, and the suggested configurations from the Dell documentation seem were more convoluted and contradictory. Multiple documents and deployment guides had inconsistent information. Technical Support from Dell/EqualLogic has been great in helping me determine what the issue is. Unfortunately some of the potential fixes can be very difficult to execute. Firmware updates on a stacked set of 6224’s will result in the ENTIRE stack rebooting, so you have to shut down virtually everything if you want to update the firmware. The ultimate fix for this would be a revamp of the deployment guides (or lets try just one deployment guide) for the 6224’s that nullifies any previous documentation. By way of comparison, the 5424 switches were, and are very easy to deploy. The other issue that came up was some unexpected behavior regarding replication, and it’s use of free pool space. I don’t have any empirical evidence to tie these two together, but this is what I had observed. During this past month in which I had an old physical storage server fail on me, there was a moment where I had to provision what was going to be a replacement for this box, as I wasn’t even sure if the old physical server was going to be recoverable. Unfortunately, I didn’t have a whole lot of free pool space on my array, so I had to trim things up a bit, to get it to squeeze on there. Once I did, I noticed all sorts of weird behavior. 1. Since my replication jobs (with ASM/ME and ASM/VE) leverage the free pool space for the creation of temporary replica/snap that is created on the source array, this caused problems. The biggest one was that my Exchange server would completely freeze during it’s ASM/ME snapshot process. Perhaps I had this coming to me, because I deliberately configured it to use free pool space (as opposed to a replica reserve) for it’s replication. How it behaved caught me off guard, and made it interesting enough for me to never want to cut it close on free pool space again. 2. ASM/VE replica jobs also seems to behave odd with very little free pool space. Again, this was self inflicted because of my configuration settings. It left me desiring a feature that would allow you to set a threshold so that in the event of x amount of free pool space remaining, replication jobs would simply not run. This goes for ASM/VE and ASM/ME. Once I recovered that failed physical system, I was able to remove that VM I set aside for emergency turn up. That increased my free pool space back up over 1TB, and all worked well from that point on. Lastly, one subject matter came up that doesn’t show up in any deployment guide I’ve seen. The timing of all this protection shouldn’t be overlooked. One wouldn’t want to stack several replication jobs on top of each other that use the same free pool space, but haven’t had the time to replicate. Other snapshot jobs, replicas, consistency checks, traditional backups, etc should be well coordinated to keep overlap to a minimum. If you are limited on resources, you may also be able to use timing to your advantage. For instance, set your daily replica of your Exchange database to occur at 5:00am, and your daily snapshot to occur at 5:00pm. That way, you have reduced your maximum loss period from 24 hours to 12 hours, just by offsetting the times.